Na'ama bay is a happening place in the evenings, with both modern and traditional music and entertainment running through the whole night. From fine dining to outdoor cafes everything is available. Both hotels themselves which have a range of different night clubs, bars and lounges, through to the establishments along the main strip of King of Bahrain Road which offer open air entertainment there is something for everybody. In Na'ama Bay you find the most concentrated nightlife in all of Sharm el Sheikh. 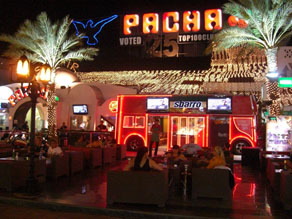 Here is international chains like Hard Rock Cafe as well as well known local clubs including Pasha Club and Camel Bar. And of course there are many night spots and bars in the range of resorts and hotels that back on to the road. Outdoor seating is the norm in the evenings when the temperature is cool, and remember it never really rains in Na'ama Bay, so every night is a great night out sit under the stars. Though with the pretty twinkling lights outside most restaurants and bars you may not see celestial stars at all! Waiters from the different bars stand outside and describe the offers available for you inside in friendly terms. Please feel free to listen to their descriptions but also to try another option for yourself! The street is busy with locals and visitors walking along the strip seeing things that are happening, just people watching, or enjoying the music from the many live entertainments. Ali Baba Oriental Cafe - Traditional Egyptian male dancers, with a live Egyptian band, and also Dervish dancing are held at this cafe on the Plaza Mall which has both inside and outside seating.